Crusaders in Tripoli. Bohemond V, AD 1233-1251. Date : This type was issued after AD 1235. 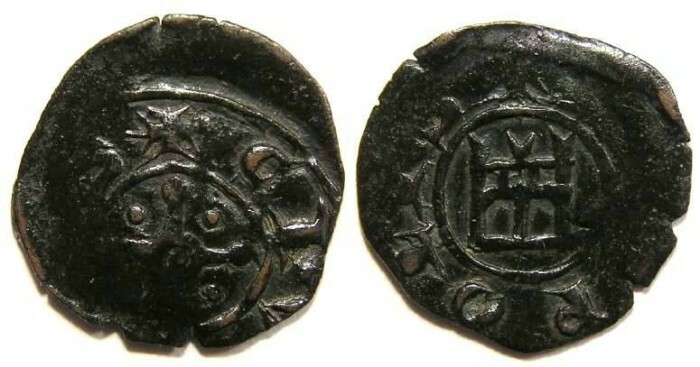 Reference : Coinage in the Crusader States -Tripoli #21 variety. Size : 15.5 x 16.4 mm. Weight : 0.77 grams. Grade : VF but off center with weak areas (not unusual on these). Obverse : Cross pommetee with a pellet in the center and pellets in the angles, and CIVITAS around. Reverse : Genoese gateway with TRIPOLIS around.